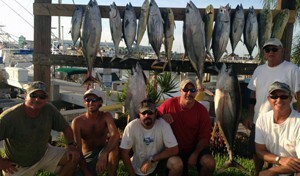 Offshore fishing with Ofishal Business can be an exciting and rewarding fishing adventure. Some very large fish make this area of Cocoa, Titusville, and Melbourne their permanent home. 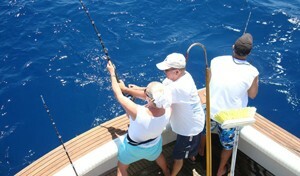 You can find great fishing 20 miles offshore or we can venture out 50 or 60 miles to catch some real big fish. These can include Amberjack, Grouper, and other bottom fish in addition to the Mahi Mahi, Sail fish, Wahoo, and King Mackerel we regularly fish for. Our Port Canaveral & Cocoa Beach offshore fishing charters for visitors from Orlando, Cocoa Beach, and Cape Canaveral can expect the best in charter services right here at Ofishal Business. We have multiple boats and Captains who are extremely experienced in targeting Florida’s famous offshore species. Guided offshore fishing trips take place 20 to 40 miles offshore in the open Atlantic waters east of Orlando in search of Dolphin, Wahoo, Blackfin tuna, Sailfish, Cobia, Grouper, Snapper, and more. Many different time slots available. Click the link below for real time reservations. 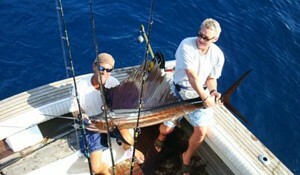 The Port Canaveral & Cocoa Beach offshore fishing in the state of Florida is second to none. 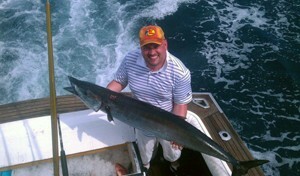 Come see why we are truly the Sportfishing Capital of the World. 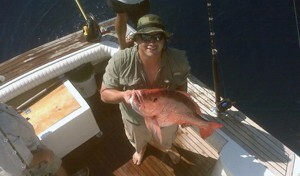 We offer fishing all the way to Bimini. Heading out with Ofishal Business into the Port Canaveral & Cocoa Beach deeper waters, our clients are suddenly exposed to a pool of deep sea species. These are different than the regular shallow water and nearshore area species. 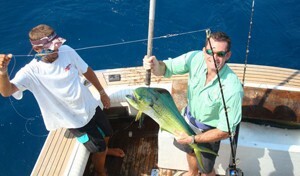 Big game fish – sharks, tuna, bull mahi, marlin, and sailfish come to mind. You normally will not find these species near shore, as they require deeper waters to feed. However, Florida has some exceptions, with Mahi, Sailfish, and smaller tuna species finding their way nearshore and can be fairly common during certain seasons. If you have never fished in Port Canaveral & Cocoa Beach deep sea conditions before, chartering a boat and going out with an experienced Captain is a must. Of course, we are here at your disposal to bring you not only the safety and expertise you are looking for, but the actual excitement of hooking into a beast of the open ocean is just a click away with Ofishal Business Charters. Even if you’ve deep sea fished many times, experiencing a day or two on our Blackwatch 40 and this crew will open all new doors to your fishing experiences.